Mahmoud Labib, Reza M. Mohamadi, Mahla Poudineh, Sharif U. Ahmed, Ivaylo Ivanov et al. Cell-to-cell variation in gene expression creates a need for techniques that characterize expression at the level of individual cells. Now, a technique for characterizing mRNA expression has been developed. The technique uses the intracellular self-assembly of magnetic nanoparticles to quantitate RNA levels at the single-cell level. Davoud Mozhdehi, Kelli M. Luginbuhl, Joseph R. Simon, Michael Dzuricky, Rüdiger Berger et al. Inspired by the post-translational modifications of polypeptides widespread in biological systems, the one-pot synthesis of biohybrid materials was engineered within Escherichia coli using a recombinant expression and post-translational lipidation. The fatty-acid-modified elastin-like polypeptides (FAMEs) prepared, which comprise peptide-amphiphile segments prone to self-assembly fused to a thermally responsive elastin-like polypeptide, exhibit temperature-triggered hierarchical assembly. A low-power laser can cause phase separation or trigger the nucleation of a new phase in the proximity of a liquid–liquid critical point, or binodal, using a laser tweezing potential. This effect explains the physics behind non-photochemical laser-induced nucleation and suggests new ways of manipulating matter. Krzysztof Ziach, Céline Chollet, Vincent Parissi, Panchami Prabhakaran, Mathieu Marchivie et al. 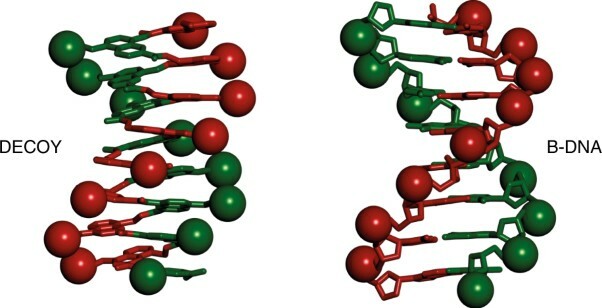 Molecules that mimic the charge surface of B-DNA could enable the inhibition of DNA processive enzymes. Now, helically folded aromatic oligoamide scaffolds have been synthesized that display anions at positions similar to that of B-DNA phosphates. These foldamer mimics can recognize some DNA binding proteins and inhibit enzymes such as HIV integrase and topoisomerase 1. Astrid Bergeat, Simon Chefdeville, Michel Costes, Sébastien B. Morales, Christian Naulin et al. Collision-induced spin–orbit transitions involve multiple interaction potentials and are by nature non-adiabatic, complicating both their experimental and theoretical study. Crossed-beam experiments and non-Born–Oppenheimer quantum calculations for inelastic collisions of carbon atoms with helium atoms, down to energies corresponding to temperatures below 10 K, have now been performed. Quantum-dynamical resonances predicted by theory were experimentally detected. Samuel I. A. Cohen, Risto Cukalevski, Thomas C. T. Michaels, Anđela Šarić, Mattias Törnquist et al. Mapping energy landscapes has proved to be a powerful approach for studying reaction mechanisms. Now, this strategy has been applied to determine the activation energies and entropies that characterize the molecular steps in the misfolding and aggregation of the amyloid-β peptide, revealing striking differences between the thermodynamic signatures of primary and secondary nucleation. Seoung-Bum Son, Tao Gao, Steve P. Harvey, K. Xerxes Steirer, Adam Stokes et al. Mg-based batteries possess potential advantages over their lithium counterparts; however, the use of reversible oxidation-resistant, carbonate-based electrolytes has been hindered because of their undesirable electrochemical reduction reactions. Now, by engineering a Mg2+-conductive artificial interphase on a Mg electrode surface, which prevents such reactivity, highly reversible Mg deposition/stripping in carbonate-based electrolytes has been demonstrated. Xuekai Zhang, Gang Lu, Meng Sun, Madhu Mahankali, Yanfei Ma et al. Peptide macrocycles are uniquely suited to engage some challenging biological targets, such as protein–protein interactions. Inspired by the ‘C–H’ cross-linked peptide natural products, a highly efficient and generally applicable strategy for constructing cyclophane-braced peptide macrocycles has been developed. The strategy is based on palladium-catalysed intramolecular C(sp3)–H arylation reactions. Tijs Karman, Mark A. J. Koenis, Agniva Banerjee, David H. Parker, Iouli E. Gordon et al. Molecular collisions can lead to the absorption of incident light even for transitions that are spectroscopically forbidden for the isolated molecules. Now the electronic–vibrational transitions of O2 have been theoretically studied and, contrary to textbook knowledge, it is shown that the absorption mechanism and the spectral line shape depend on the collision partner, oxygen or nitrogen. The biosynthesis of the [FeFe] hydrogenase active site H-cluster requires several Fe–S proteins that perform poorly understood reactions. Now, a reaction intermediate trapped in the enzyme HydG is shown to contain a [(Cys)Fe(CO)(CN)] species identified as the first organometallic Fe moiety en route to the catalytic H-cluster. Scattering of molecules at low temperature that are prepared in single quantum states illuminates the mechanism of rotationally inelastic collisions and reveals the reorientation of partner molecules. By correlating each outgoing partial wave with the incoming waves, partial-wave analysis of the scattering angular distribution determines the dominant short- and long-range anisotropies of the interaction potential. Kazuki Tanifuji, Chi Chung Lee, Nathaniel S. Sickerman, Kazuyuki Tatsumi, Yasuhiro Ohki et al. The M-cluster in the active site of nitrogenase is derived from an 8Fe core assembled via coupling and rearrangement of two [Fe4S4] clusters concomitant with the insertion of an interstitial carbon and a ninth sulfur. Now, by combining synthetic [Fe4S4] clusters and assembly with a protein template, it has been shown that sulfite gives rise to the ninth sulfur that is inserted into the nitrogenase cofactor after the radical SAM-dependent carbide insertion and cofactor core rearrangement.